I’ve always wanted a rubberband gun, so when I saw awesome kits by Rubberband Tech at Maker Faire Detroit I had to get one. I could have a sweet gun and build it myself. The 1911 immediately got my attention because of the slide action and the functional clip. The hardwood version (I picked zebrawood) of the kit was an extra $10 to make it $30 and a big bag of extra rubberbands was $5. The build, spread over several days, took about 7 or 8 hours, which was much longer and harder than expected. A lot of difficulties were from the instructions being short on details. They tell you to sand several pieces but don’t get into how much sanding is required (A lot and then a lot more! ), especially to get the trigger mechanism working properly. I tried to video the entire process, ending up with over 140 GB of footage! On a first pass through iMovie at 20x fast forward the video was way too long, so I exported and ran it back through at 8x more. At the end of the video is a demo at normal speed showing the gun in action. The stain I used on the zebrawood pieces was called Espresso and the one I used on the rest of the gun was an English Chestnut. I finished it off with 2 coats of a finishing wax. As mentioned in the video, I’m not happy with the end result of the staining. 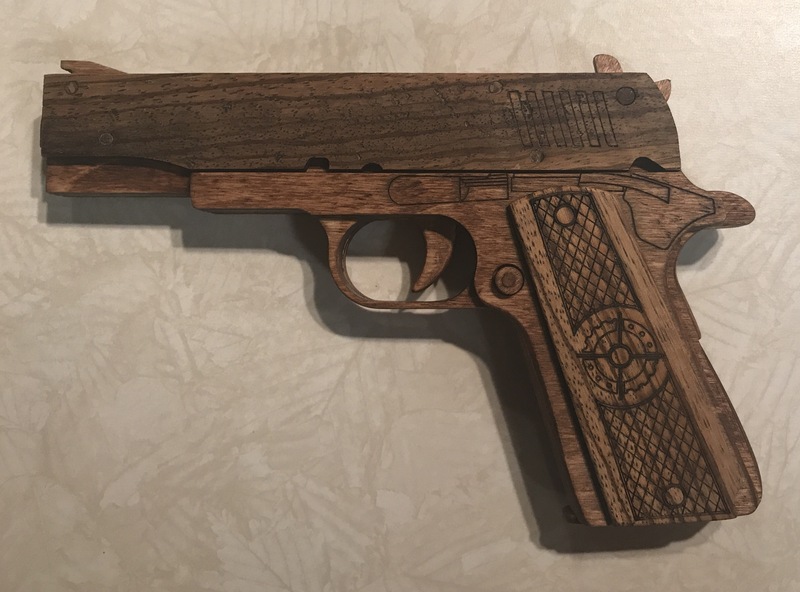 I wish I had done a second coat of the espresso stain on the hardwood pieces, or gotten a little lighter stain for the rest of the gun, or even both. Now I need to make some targets. I have some ideas involving electronics for timing and scoring.